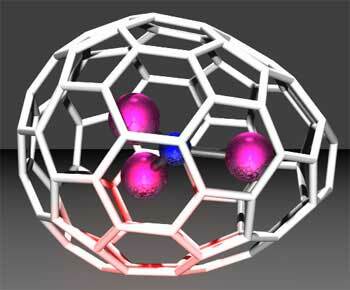 (Nanowerk News) An egg-shaped fullerene, or "buckyball egg" has been made and characterized by chemists at UC Davis, Virginia Tech and Emory and Henry College, Va. The unexpected discovery opens new possibilities for structures for fullerenes, which could have a wide range of uses. "It was a total surprise," said Christine Beavers, a chemistry graduate student working with Professors Alan Balch and Marilyn Olmstead at UC Davis. Beavers is first author on the paper, published this month in the Journal of the American Chemical Society. Fullerenes, sometimes called "buckyballs," are usually spherical molecules of carbon, named after the futurist R. Buckminster Fuller, inventor of the geodesic dome. The carbon atoms are arranged in pentagons and hexagons, so their structures can resemble a soccer ball. An important rule -- until now -- is that no two pentagons can touch, but are always surrounded by hexagons. The "buckyegg" compound was made by collaborating scientists at Virginia Tech, led by Professor Harry Dorn. They heated a mixture of carbon and other ingredients under special conditions to make a mixture of fullerenes, then shipped the products to UC Davis, where Balch's group worked on characterizing their structures. When Beavers started to map out the structure, she found two pentagons next to each other, making the pointy end of the egg. Initially she thought that the results were a mistake, but she showed the data to Marilyn Olmstead, an expert on X-ray crystallography, and they decided that the results were real. The egg contains a molecule of triterbium nitride inside. The experiment was actually part of a project to find new, more predictable ways to make fullerenes, Beavers said. The researchers were trying to make fullerenes with atoms of terbium, a metal from the lanthanide series of the periodic table, trapped inside. Metals similar to terbium are used as contrast agents for some medical scanning procedures. By putting these metals inside fullerenes, the researchers hope to make compounds that could be both medically useful and well-tolerated in the body. The other authors on the research paper are Tianming Zuo and Kim Harich at Virginia Tech and James Duchamp at Emory and Henry College. Funding was provided by grants from the National Science Foundation and the National Institutes of Health.